Apollo Bio Fins are the only split fins made from 100% natural rubber material. Independently voted the best overall fin in the world by Scuba Diving Magazine and the first choice of many Military Special Forces units worldwide. The Bio-Fin has proven to be a superior design for short and long distance water operations. Its capability covers all aspects of military operations such as MCT, MTO, MCM and UBDR. Rubber Strap is most common choice for military. Strap adjusts in seconds to suit a wide variety of footwear and users. Press clip to adjust length. Quick release buckle. Spring Strap is extremely durable and easiest to don and doff. Fins sold with specific length of spring. Additional spring lengths available. T20 driver is required to change spring. Auto adjusts to remain snug throughout dive. 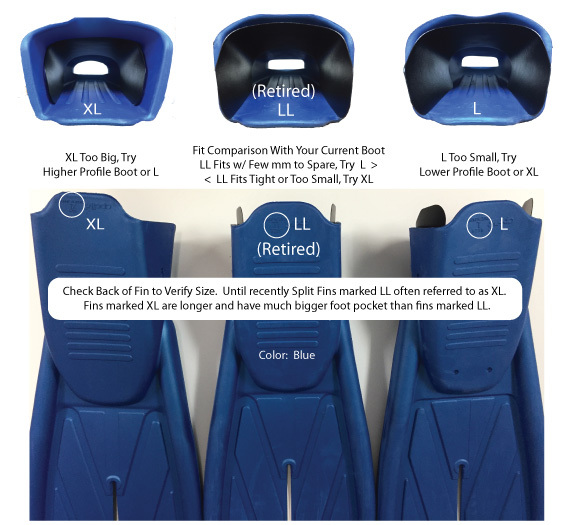 Apollo Bio Fins are designed with a 20º angle to accommodate diver's natural tendency to bend slightly at the ankle and knee. The result is maximum on demand propulsion with the least amount of stress on body. Apollo's choice of superior material and intelligent design provide divers with quick acceleration and the ultimate in power, speed and control. Bio Fins provide lift and propulsion with less effort and more power. Unlike other fins which push water up and down, Bio Fin blade directs water flow over the leading and trailing edges to provide power, lift and forward thrust on each stroke. Efficient Kicking A wider kick results in loss of momentum. Whether your traveling at cruise speed or powering through current keep your kicks small. You will move quicker and more efficiently. Operators prefer to use the Bio Fin Pro series because the natural rubber is negatively buoyant. The flexibility of rubber increases thrust and reduces the risk of surface splashing. If the operator is required to discard the fin, it will sink to the bottom so as not to alert the target of operators presence. The design of the fin make it ideal for helicopter drops.